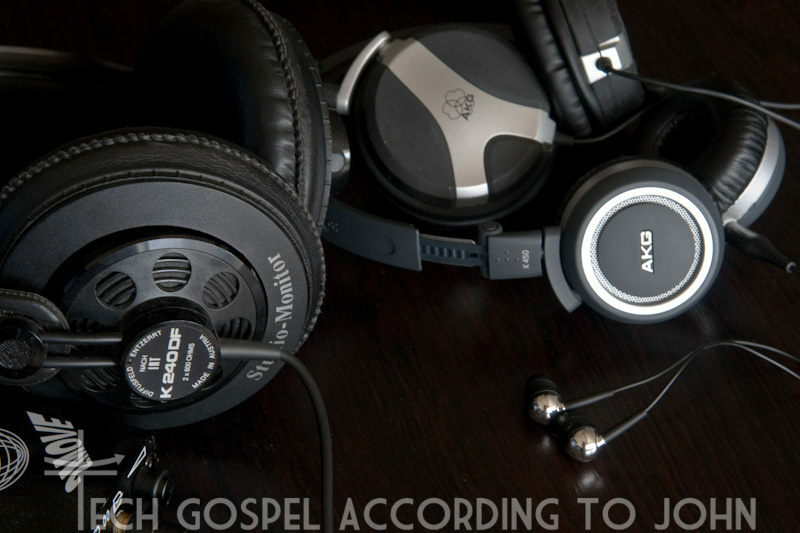 Tech Gospel According To John: Do You Hear What I Hear? It's almost Christmas! The next few posts I'll have will be some small gadget gift ideas. Let's begin with gift ideas for the ever popular iPod or digital music player. I've been noticing more and more people using circumaural headphones (full-sized) out in the streets. I really do prefer how these sound over in-ears, although for travel and convenience, there are a lot of good in-ears nowadays. The main advantage of upgrading from the included iPod earphones is almost like going from an AM radio to a full sized stereo system. My personal fav are my AKG K240 DF mated with a Corda 2Move amp, although it seems that Jan Meier (no relation to John Mayer) no longer has crossfeed built into his smaller portable amps) But for traveling, I bring my smaller AKG K324P or K81DJ (aka 518DJ) ... although I'm personally partial to AKG, there are many brands that are excellent, like Sennheiser, Grado, Etymotic, Shure, and JBL to name a few. Some of the newer brands like Skullcandy, Monster and Urbanears sound decent as well, and have very funky designs too! Seeing as how a music player is almost as common as having a mobile phone, it does make sense that the earphones, which are the most visible part of the gadget, look good aside from sounding great. If you're planning on giving a set of earphones to a girl, they have very nice and classy designs as well. Swarovski crystals, Lady Gaga designs, pastel colors, smoother shapes and designs and color coordinated wires/cords all help remove the industrial look that earphones used to have.